Say hello to KEANU REEVES, I mean Duke Caboom, Canada’s greatest stuntman – and he’s everything you could want from a stuntman, only he can’t actually do the stunts that feature in his commercials. He certainly looks the part though, with a handlebar moustache and a red and white jumpsuit. And what he lacks in technique he certainly makes up for in swagger. 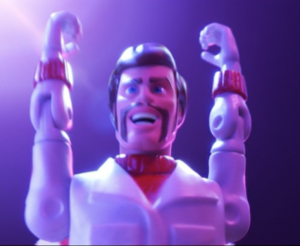 Caboom (I really hope a final exclamation mark forms part of his name) appears at the very end of the new Toy Story 4 tailer, which is probably going to make a lot of you cry. (I cried. I cried out “KEANU!” when Duke Caboom appeared. I have a heart of stone, wrapped in stone though). 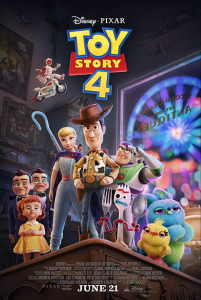 Toy Story 4 is released in the US and the UK on 21 June 2019. The movie also stars Tom Hanks as Woody, Tim Allen as Buzz Lightyear, Annie Potts as Bo Peep, Joan Cusack as Jessie, Jordan Peele as Bunny and Keegan-Michael Key as Ducky.